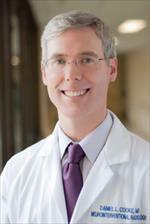 Daniel Cooke, MD, is an Associate Professor in Residence of Neuro Interventional Radiology in the Department of Radiology and Biomedical Imaging at the University of California, San Francisco. His expertise is in ischemic and hemorrhagic stroke, vascular malignancies of the central nervous system, arteriovenous malformations (AVM), arteriovenous fistula (AVF), and aneurysms of the brain and spine. Dr. Cooke earned his medical degree from Emory University, Atlanta in 2004, and completed his residency in Diagnostic Radiology at the University of Washington, Seattle. He completed a fellowship in Neuroradiology at the University of Washington, Seattle in 2010, followed by another fellowship in Neuro Interventional Radiology from the University of California, San Francisco in 2012. Guzick AG, Cooke DL, McNamara JPH, Reid AM, Graziano PA, Lewin AB, Murphy TK, Goodman WK, Storch EA, Geffken GR. Parents' Perceptions of Internalizing and Externalizing Features in Childhood OCD. Child Psychiatry Hum Dev. 2019 Feb 18. Jiam NT, Gilbert M, Cooke D, Jiradejvong P, Barrett K, Caldwell M, Limb CJ. Association Between Flat-Panel Computed Tomographic Imaging-Guided Place-Pitch Mapping and Speech and Pitch Perception in Cochlear Implant Users. JAMA Otolaryngol Head Neck Surg. 2018 Nov 21. McGregor H, Sun Z, McCoy D, Kumar V, Conrad M, Wilson M, Cooke D. Endovascular Biopsy and Endothelial Cell Gene Expression Analysis of Dialysis Arteriovenous Fistulas: A Feasibility Study. J Vasc Interv Radiol. 2018 Oct; 29(10):1403-1409.e2. LaHue SC, Kim H, Pawlikowska L, Nelson J, Cooke DL, Hetts SW, Singh V. Frequency and characteristics associated with inherited thrombophilia in patients with intracranial dural arteriovenous fistula. J Neurosurg. 2018 Apr 01; 1-5. Morrison J, Alexander MD, Dowd CF, Cooke DL. Flanking the fenestration: circumferential limb-to-limb stent-assisted coiling of a basilar artery fenestration aneurysm. J Neurointerv Surg. 2018 Jun; 10(6):e12. Alexander MD, Hippe DS, Cooke DL, Hallam DK, Hetts SW, Kim H, Lawton MT, Sekhar LN, Kim LJ, Ghodke BV. Targeted Embolization of Aneurysms Associated With Brain Arteriovenous Malformations at High Risk for Surgical Resection: A Case-Control Study. Neurosurgery. 2018 Mar 01; 82(3):343-349. Yu JF, Nicholson AD, Nelson J, Alexander MD, Tse SH, Hetts SW, Hemphill JC, Kim H, Cooke DL. Predictors of intracranial hemorrhage volume and distribution in brain arteriovenous malformation. Interv Neuroradiol. 2018 Apr; 24(2):183-188. Hirabayashi KE, Kalin-Hajdu E, Bever GJ, Vagefi MR, de Alba Campomanes AG, Cooke DL, Dowd CF, Kersten RC. Normalization of Congenital Venous Stasis Retinopathy Following Sclerotherapy of a Macrocystic Lymphatic Malformation. Ophthalmic Plast Reconstr Surg. 2018 Jan/Feb; 34(1):e19-e21. Morrison J, Alexander MD, Dowd CF, Cooke DL. Flanking the fenestration: circumferential limb-to-limb stent-assisted coiling of a basilar artery fenestration aneurysm. BMJ Case Rep. 2017 Oct 13; 2017. Burkhardt JK, Chen X, Winkler EA, Weiss M, Yue JK, Cooke DL, Kim H, Lawton MT. Early Hemodynamic Changes Based on Initial Color-Coding Angiography as a Predictor for Developing Subsequent Symptomatic Vasospasm After Aneurysmal Subarachnoid Hemorrhage. World Neurosurg. 2018 Jan; 109:e363-e373. Chen X, Cooke DL, Saloner D, Nelson J, Su H, Lawton MT, Hess C, Tihan T, Zhao Y, Kim H. Higher Flow Is Present in Unruptured Arteriovenous Malformations With Silent Intralesional Microhemorrhages. Stroke. 2017 10; 48(10):2881-2884. Moughamian AJ, Morshed RA, Colorado RA, Liner Z, Cooke D, Hemphill JC. Teaching NeuroImages: Artery of Percheron aneurysm masquerading as ICH spot sign. Neurology. 2017 08 08; 89(6):e64-e65. Mamlouk MD, Nicholson AD, Cooke DL, Hess CP. Diffusion-weighted imaging for cutaneous vascular anomalies. Clin Imaging. 2017 Nov - Dec; 46:121-122. Derdeyn CP, Zipfel GJ, Albuquerque FC, Cooke DL, Feldmann E, Sheehan JP, Torner JC. Management of Brain Arteriovenous Malformations: A Scientific Statement for Healthcare Professionals From the American Heart Association/American Stroke Association. Stroke. 2017 08; 48(8):e200-e224. Mamlouk MD, Nicholson AD, Cooke DL, Hess CP. Tips and tricks to optimize MRI protocols for cutaneous vascular anomalies. Clin Imaging. 2017 Sep - Oct; 45:71-80. Burkhardt JK, Chen X, Winkler EA, Cooke DL, Kim H, Lawton MT. Delayed Venous Drainage in Ruptured Arteriovenous Malformations Based on Quantitative Color-Coded Digital Subtraction Angiography. World Neurosurg. 2017 Aug; 104:619-627. Zhang X, Martin A, Jordan C, Lillaney P, Losey A, Pang Y, Hu J, Wilson M, Cooke D, Hetts SW. Design of catheter radio frequency coils using coaxial transmission line resonators for interventional neurovascular MR imaging. Quant Imaging Med Surg. 2017 Apr; 7(2):187-194. Alexander MD, Cooke DL, Hallam DK, Kim H, Hetts SW, Ghodke BV. Less can be more: Targeted embolization of aneurysms associated with arteriovenous malformations unsuitable for surgical resection. Interv Neuroradiol. 2016 Aug; 22(4):445-51. Cooke DL, Levitt MR, Kim LJ, Hallam DK, Sekhar LN, Ghodke BV. Laser-assisted flat-detector CT-guided intracranial access. Int J Comput Assist Radiol Surg. 2016 Mar; 11(3):467-72. Mabray MC, Datta S, Lillaney PV, Moore T, Gehrisch S, Talbott JF, Levitt MR, Ghodke BV, Larson PS, Cooke DL. Accuracy of flat panel detector CT with integrated navigational software with and without MR fusion for single-pass needle placement. J Neurointerv Surg. 2016 Jul; 8(7):731-5. Raygor KP, Rowland NC, Cooke DL, Solomon DA, Huang MC. Aneurysm of the posterior meningeal artery embedded within a dorsal exophytic medullary hemangioblastoma: surgical management and review of literature. J Cerebrovasc Endovasc Neurosurg. 2014 Sep; 16(3):293-8. Sheth SA, Potts MB, Sneed PK, Young WL, Cooke DL, Gupta N, Hetts SW. Angiographic features help predict outcome after stereotactic radiosurgery for the treatment of pediatric arteriovenous malformations. Childs Nerv Syst. 2014 Feb; 30(2):241-7. Cooke DL, Johnson G, Levitt MR, Lewis DH, Sekhar LN, Ghodke B. Synchronous chronic middle cerebral artery occlusion and ipsilateral dural arteriovenous fistula. Clin Nucl Med. 2011 Jul; 36(7):570-3. Levitt MR, Cooke DL, Ghodke BV, Kim LJ, Hallam DK, Sekhar LN. "Stent view" flat-detector CT and stent-assisted treatment strategies for complex intracranial aneurysms. World Neurosurg. 2011 Feb; 75(2):275-8. Cooke DL, Levitt M, Kim LJ, Hallam DK, Ghodke B. Intraorbital access using fluoroscopic flat panel detector CT navigation and three-dimensional MRI overlay. J Neurointerv Surg. 2010 Sep; 2(3):249-51. Levitt MR, Ghodke BV, Cooke DL, Hallam DK, Kim LJ, Sekhar LN. Endovascular procedures with CTA and MRA roadmapping. J Neuroimaging. 2011 Jul; 21(3):259-62. Cooke D, Seiler D, Hallam D, Kim L, Jarvik JG, Sekhar L, Ghodke B. Does treatment modality affect vasospasm distribution in aneurysmal subarachnoid hemorrhage: differential use of intra-arterial interventions for cerebral vasospasm in surgical clipping and endovascular coiling populations. J Neurointerv Surg. 2010 Jun; 2(2):139-44. Cooke D, Koppula B, Seiler D, Rajendran J, Hallam D, Ghodke B, Lewis D. Semiquantitative software SPECT analysis in aneurysmal subarachnoid hemorrhage-related vasospasm. Nucl Med Commun. 2010 Jan; 31(1):53-8. Cooke D, Ghodke B, Natarajan SK, Hallam D. Embolization in the head and neck. Semin Intervent Radiol. 2008 Sep; 25(3):293-309.